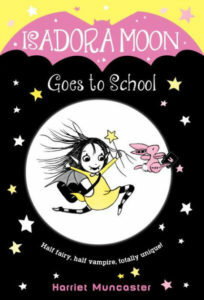 Isadora Moon is half vampire and half fairy. It is time for her to start school, but which school should she go to? Vampire school or Fairy school? She tries both and just doesn’t fit in. What is she supposed to do? In the end she finds the perfect solution. This story is cute and there are some funny moments. My only disappointment is that the “you’re different so you don’t fit in” theme is a bit stereotypical. Overall, a nice new series. An advance reader copy was provided by the publisher.